It’s remarkable how many policies in Bowen Island’s Official Community Plan (OCP) anticipate the proposal we are making for Parkview Slopes. The following table includes policies or objectives in the OCP that manage growth on the island, and which are addressed and/or implemented in part by the proposal for Parkview Slopes. A more detailed analysis will follow after First Reading. 92 The Municipality will give priority to development proposals that focus on existing development nodes, such as Snug Cove, rather than new development areas not currently identified in this OCP. 94 Snug Cove Village will contain a mix of residential, commercial, marine transportation and community facility land uses nestled within the natural setting created by Snug Cove and the surrounding lands within Crippen Regional Park. The mix of land uses will contribute to a village atmosphere that is socially interactive, commercially vibrant, pedestrian-oriented, artistically and culturally diversified, aesthetically pleasing, and environmentally sustainable. - not unfairly increase public costs for existing property owners. 106 In Snug Cove, the Municipality will consider applications for affordable, rental and special needs housing. In addition, small scale affordable, rental and special needs housing may be considered in other parts of the island, such as the Belterra site 24, where such housing conforms to other sections of the OCP. 156 A wide variety of housing forms is encouraged within Snug Cove Village, including duplexes, triplexes, fourplexes, garden apartments, stacked ground-oriented townhouses, and row housing. 159 The comprehensively planned area designated Cates Hill Residential may accommodate the following uses: detached and multi-unit housing; and educational, pre-school, and civic use facilities. 162 The Municipality will consider small lot residential development at eight lots per net developable acre with a minimum lot size of 372 m2 (4,000 sf.). 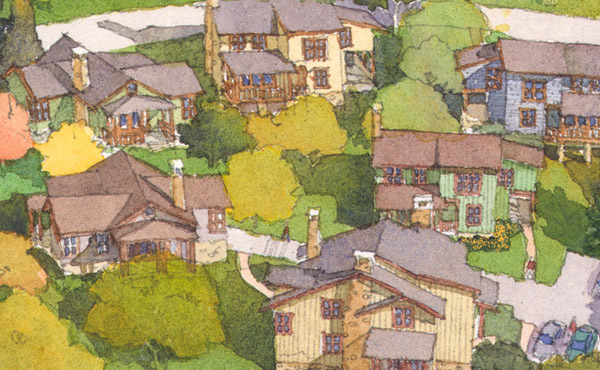 The Land Use Bylaw will contain regulations to ensure that the size of the houses on small lots is in keeping with the scale and character of a village ambiance. - the proposal involves other than traditional market-based housing, such as non-market, rental, special needs, cooperative, co-housing or price controlled, thus providing alternative housing choices for island residents. 164 Notwithstanding Policy 163, the Municipality may vary individual equivalent lot density on individual parcels of land where the building form and character and building height addresses the intent and objectives of the OCP and does not exceed three storeys. - the use of green building technology to a LEED Platinum standard. 168 The Municipality encourages the development of new, affordable forms of ground-oriented higher density housing that is consistent with affordable housing policies within this plan, and by engaging in dialogue with Metro Vancouver Housing Corporation, and other agencies. 352 The Municipality encourages the creation of small-scale Greenways such as natural microhabitats, community outdoor gathering spaces, as well as pedestrian, equestrian, and biking trails. Neighbourhood Greenways will also be encouraged to incorporate green infrastructure features such as natural storm water management, wildlife habitats, and environmentally friendly landscaping elements. 355 Within Snug Cove Village, the following types of housing are supported: detached homes, detached homes with a secondary suite, duplexes, and townhouses, multi-unit housing types, subject to the provisions of Section 3 of this OCP and the regulations of the Zoning Bylaw. 357 Within Snug Cove Village, and the Belterra Lands, the following tenures are supported: freehold, rental, and various forms of shared ownership, including cooperatives and co-housing, as well as covenanted non-market and subsidized social housing. - Housing that is compact, accessible and meets the Green Building Standards set out by the Municipality. - not be issued an occupancy permit for any phase of market housing in a development of three or more units until the corresponding affordable housing has been granted occupancy. 360 The provision of non-market rental or home ownership housing may be considered by the Municipality as an amenity at the time of rezoning. 361 To ensure that affordable rental or home ownership housing is “perpetually affordable”, the Municipality will require a Housing Agreement and a Right of First refusal Option to Purchase; both to be registered as a covenant through the Land Title Act. 365 The Municipality encourages proposals for housing in Snug Cove Village that are suitable for affordable rental or home ownership, supportive and assisted-living housing for aging residents, and supportive housing for residents with special needs. - Encourage the design of communal spaces (e.g., porches, shared gardens, common rooms) into affordable and special needs housing. The following table provides a brief summary of OCP Objectives regarding the island economy which are addressed and/or implemented by the proposal for Parkview Slopes. 169 To work toward an island economy that is relatively diverse and increasingly sustainable and innovative, meeting many of the primary needs of residents and visitors. 170 To move toward an island economy where the ratio between on-island jobs and population gradually increases. 171 To foster the creation and maintenance of local employment in island-based sustainable activities. 174 The Municipality will work in cooperation with the Bowen Island business community and interested parties to promote economic activity that builds on diversity, sustainability, innovation, and creativity. © 2009-2019 Bowen Island Properties Limited Partnership. Our purpose is to create neighbourhoods where people love to live.